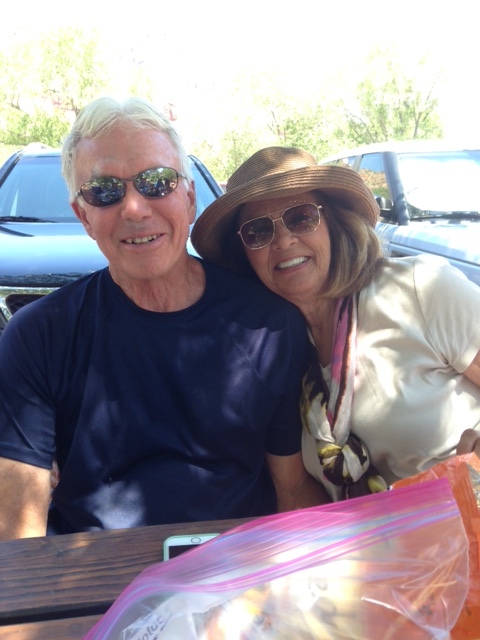 Bill and I have been camp hosts at Quail Creek State Park in Utah now since the 9th of June, 2015. We love what we are doing, and we meet lots of new and interesting people…., But it is so nice to see familiar faces like family and/or friends.. 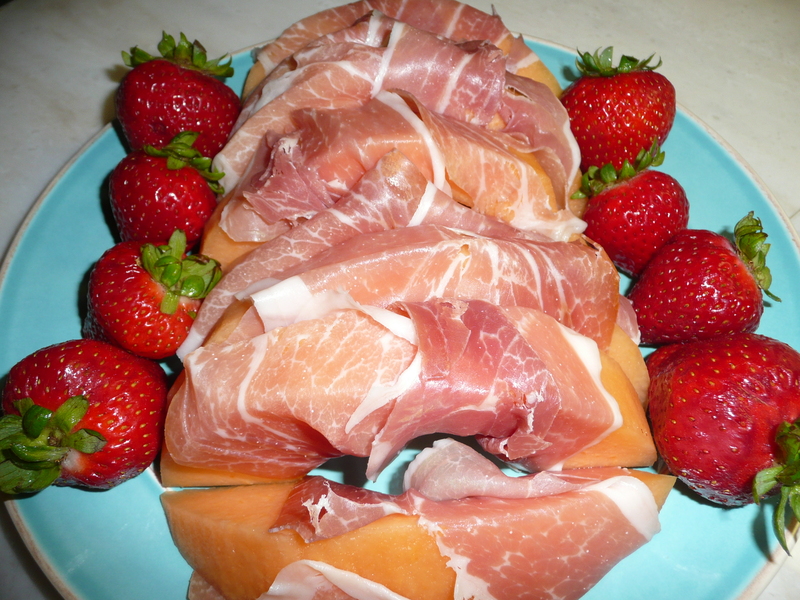 When Jim and Karen arrived, we shared appiterziers of prosciutto wrapped cantaloupe and strawberries, with chips/crackers /dips and bread…. And of course some wine/beer…. We all enjoyed our evening together catching up …. 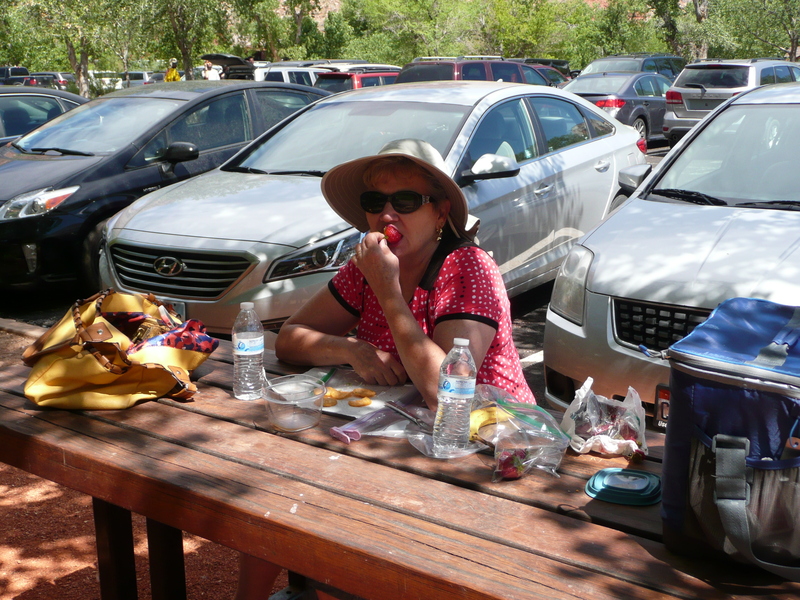 Then the next day we all went to Zion National Park, and enjoyed a full day of sightseeing there, and a picnic of leftover pasta salad , chips, etc. 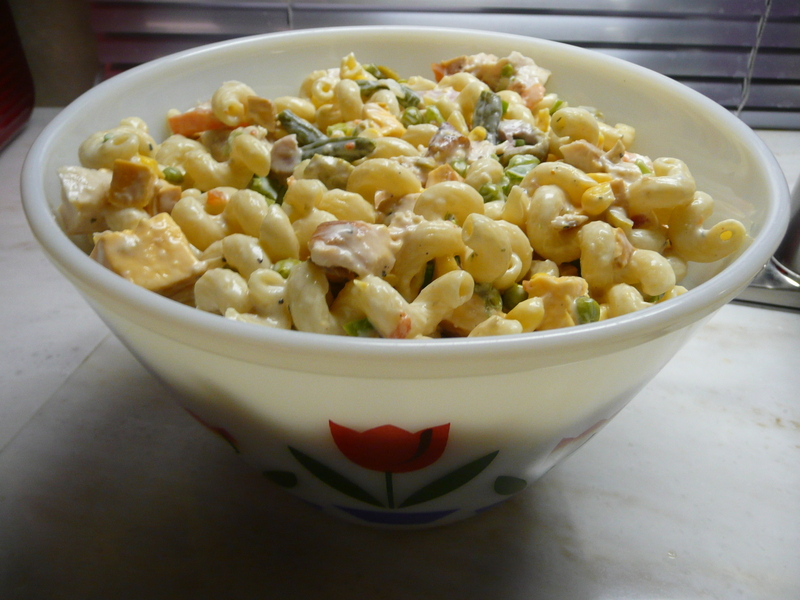 with plenty of lunch meat etc. 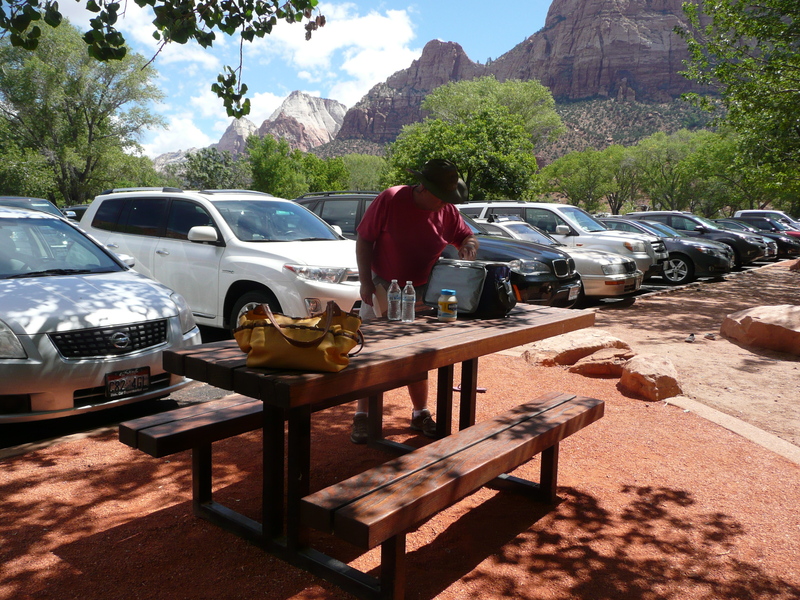 to make a perfect picnic in the Zion National Park…. 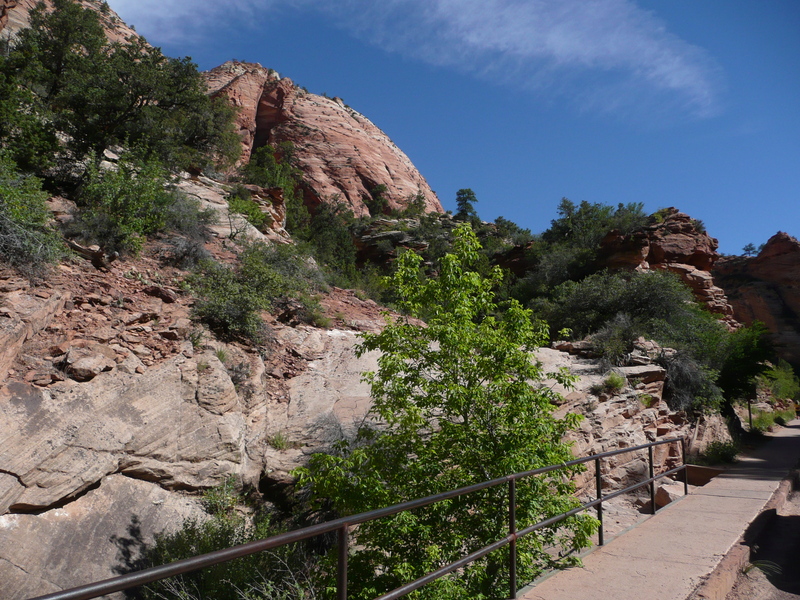 We had a beautiful morning/afternoon at Zion National Park. 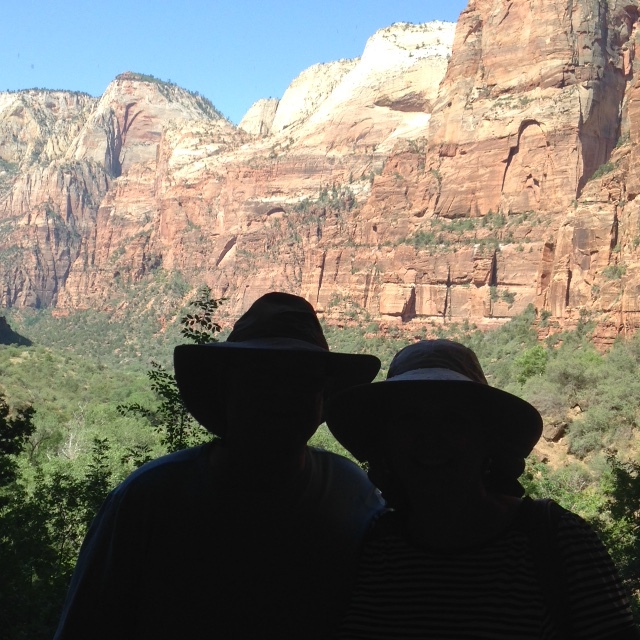 Bill and my silhouettes at Zion National Park. 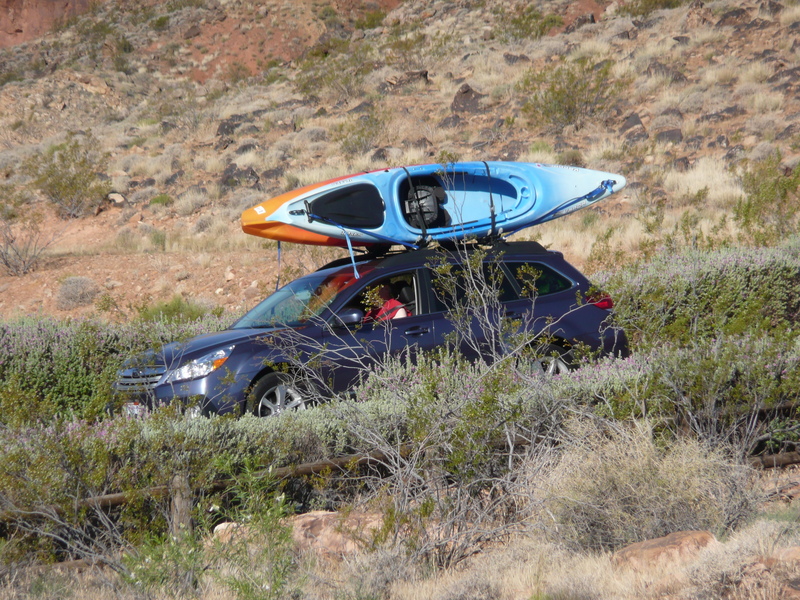 Then Jim , Karen, Bill and I all agreed we would go to our camp sites, take a break and freshen up… , then Jim and Karen in the picture below, are treating Bill and I to a Mexican food dinner tonight!!! Life just doesn’t get any better than this…. 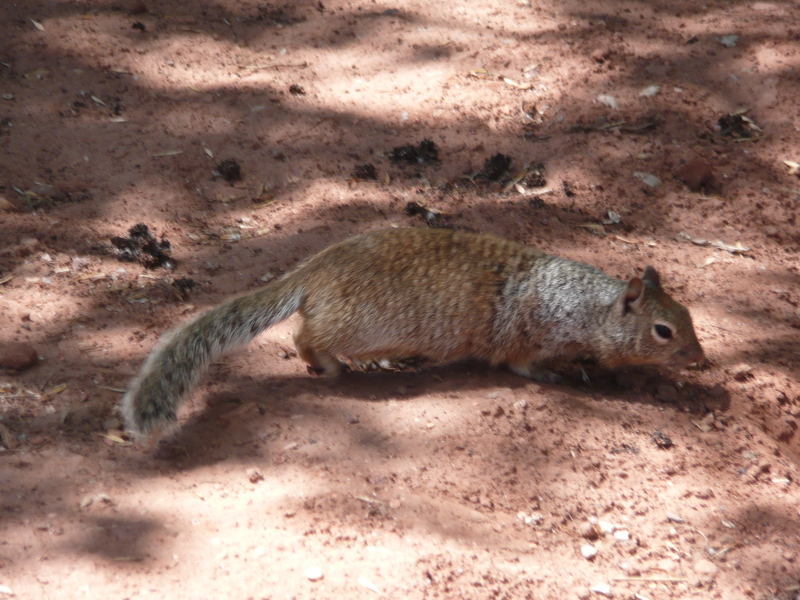 at least not in our world… Thanks Jim and Karen for being our very first visitors in our new home…. 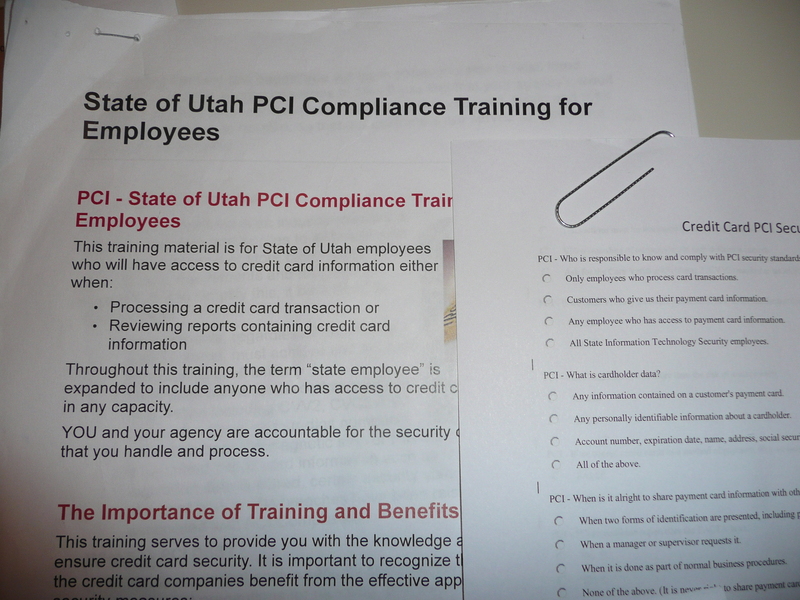 So Bill and I snagged a great work/camp gig as camp hosts at Quail Creek Park in Utah…. Camp hosts usually just make sure the camping guests have everything they need, do some light maintenance and cleaning i.e. 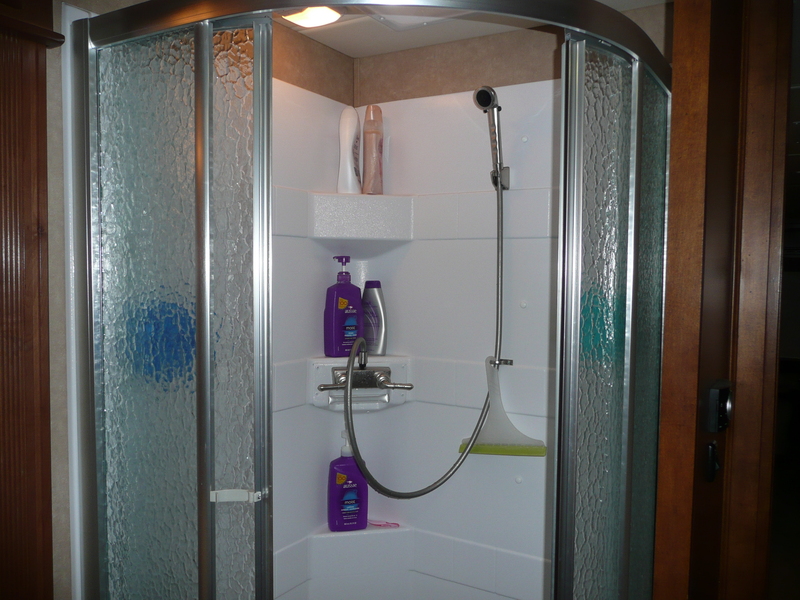 clean bathrooms and make sure they are stocked with toilet paper, hand soap, paper towels… etc. 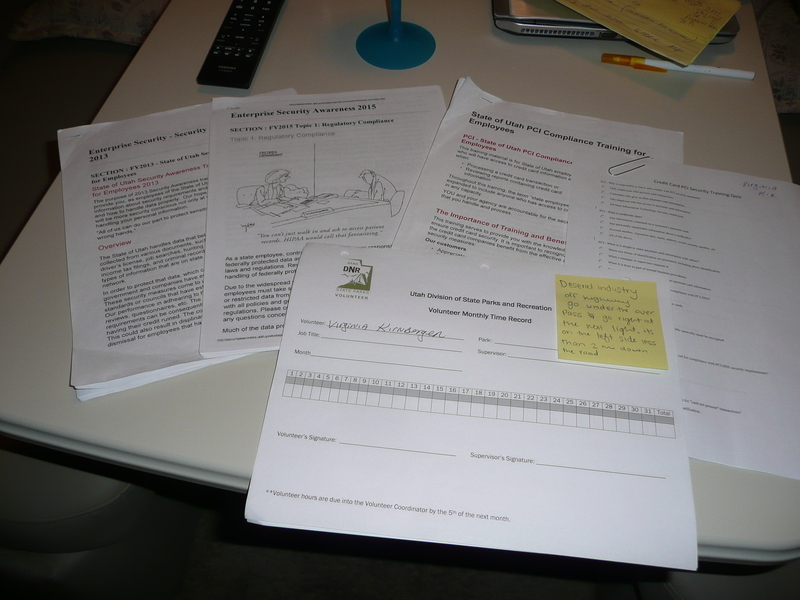 However, everyone that works at Quail Creek has to go through the quagga/zebra mussels class which Bill and I attended, and that is where I first met our Park Manager, Laura… aka, our “big boss”…. Well, lucky for me, I passed all my tests, and I am now I am an official Quail Creek Gate Booth Keeper. 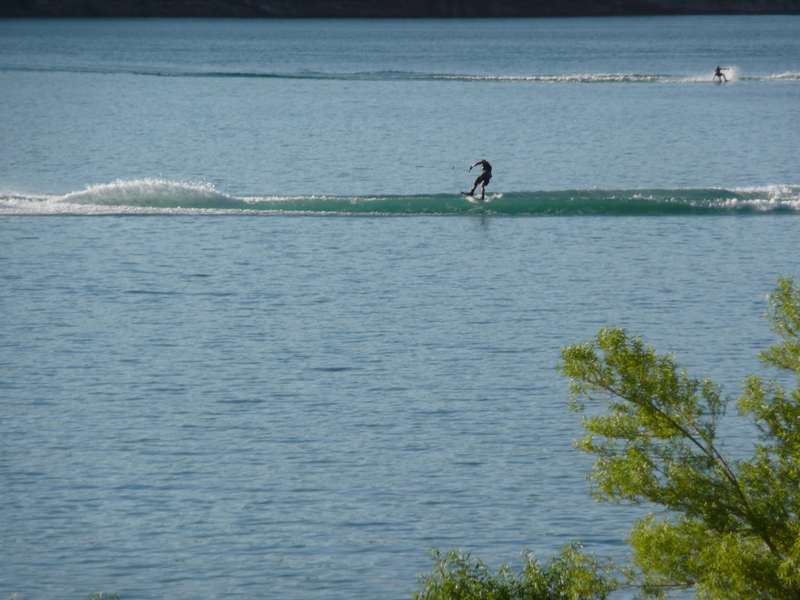 The only thing between you getting your watercraft on our water…. is me… YIKES!!! But seriously, I LOVE what I am doing and learning. I told Bill that when we retire “I don’t want us to just sit around and watch TV… I want to stay active and continue to learn something new every day.” Mission accomplished for SURE there! 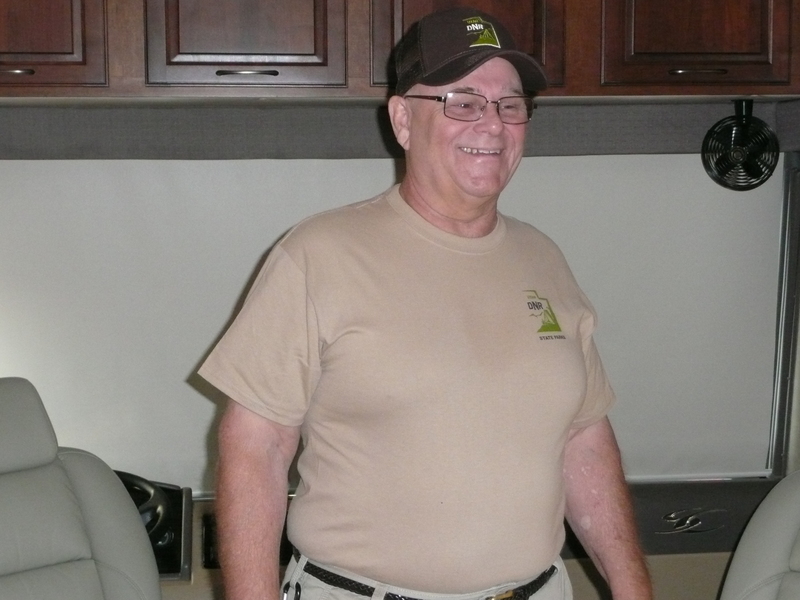 This is Bill in his official Quail Creek maintenance uniform. P.S. I had a reader report to me that she follows my blog but is no longer receiving automatic email notifications when I create a new post. Thanks Karen Reno for reporting that to me as I have no other way of knowing that something might be wrong with my blog unless one of my readers reports it to me… 🙂 I would like to ask that if any of my readers that follow my blog are not receiving an auto email notification please let me know so I can look into what the problem is. I have my blog linked to Facebook where you can see when I make a new post, but if you follow my blog you should receive an email notification as well. If you are not please let me know. I suspect that just like everyone else, I get up in the morning and make up the sleep number bed. I love that bed and couldn’t believe I would have one in a motorhome. 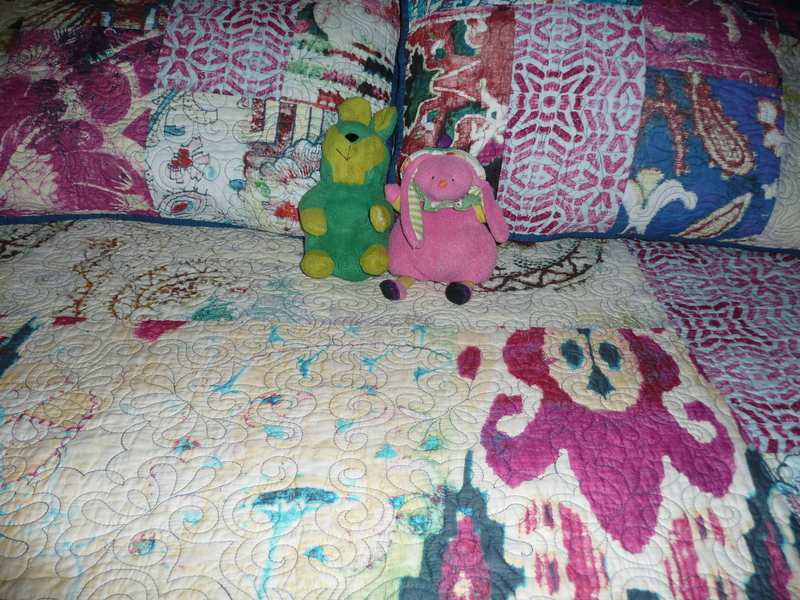 Notice Velveteen (green and yellow) and Hug-a-Muffin (two of Shantel’s favorite childhood toys that she left behind but I just couldn’t) are enjoying the sleep number bed too. 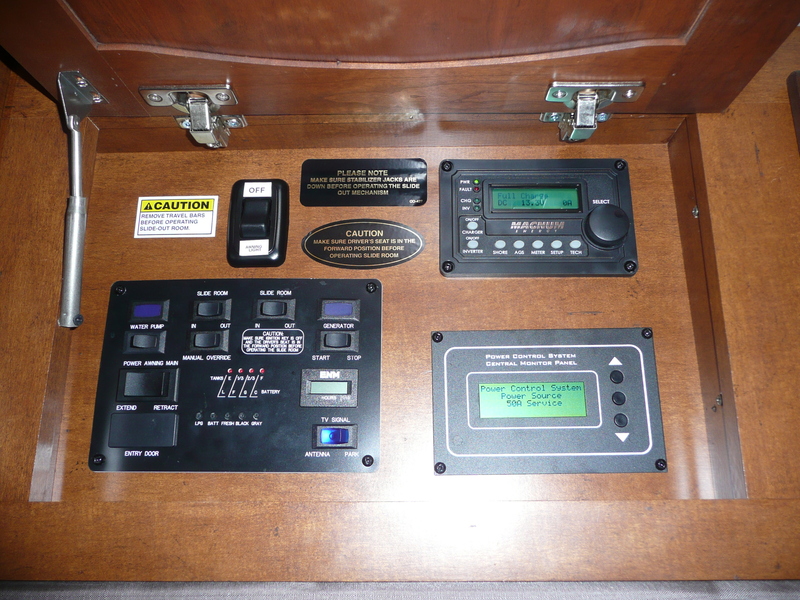 There is lots of storage space in our motorhome, even under the sleep number bed. 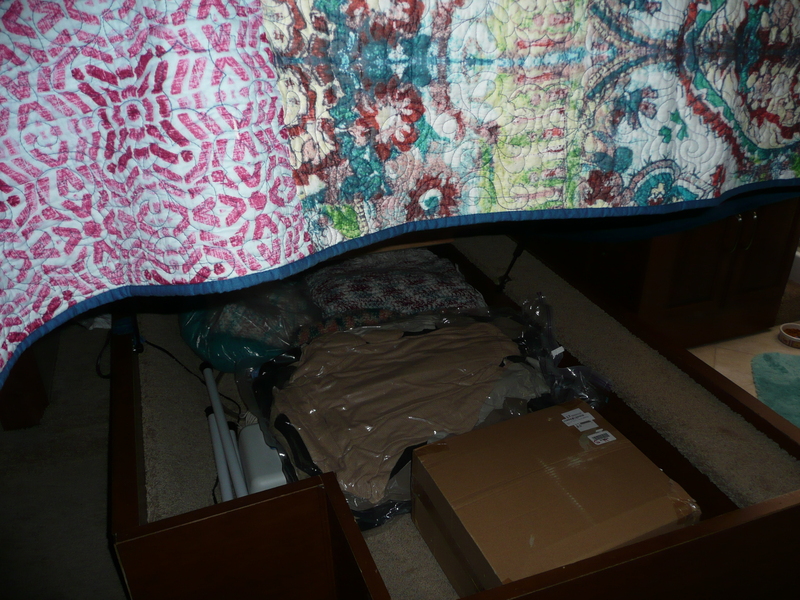 The mattress lifts right up to reveal a nice storage space where we keep extra blankets and our winter coats that are nicely tucked into vacuum sealed storage bags. 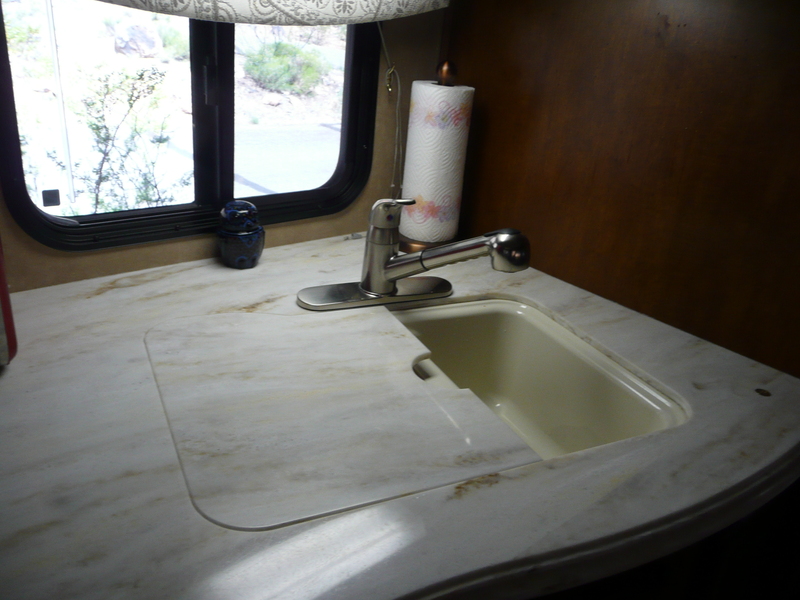 or you can cover both sinks for extra food prep space.. When we are not working (we only work 20-30 hours combined between Bill and I), after a morning of lounging around enjoying coffee and watching the people out on the lake, I will go in and take my shower. Nothing to complain about here… We have hot and cold running water even when we are not hooked up to full electric, sewer, and water because we also have solar panels on the roof outside. Sorry, I wasn’t going to climb on the roof to capture that picture you will just have to take my word for it… Ha! 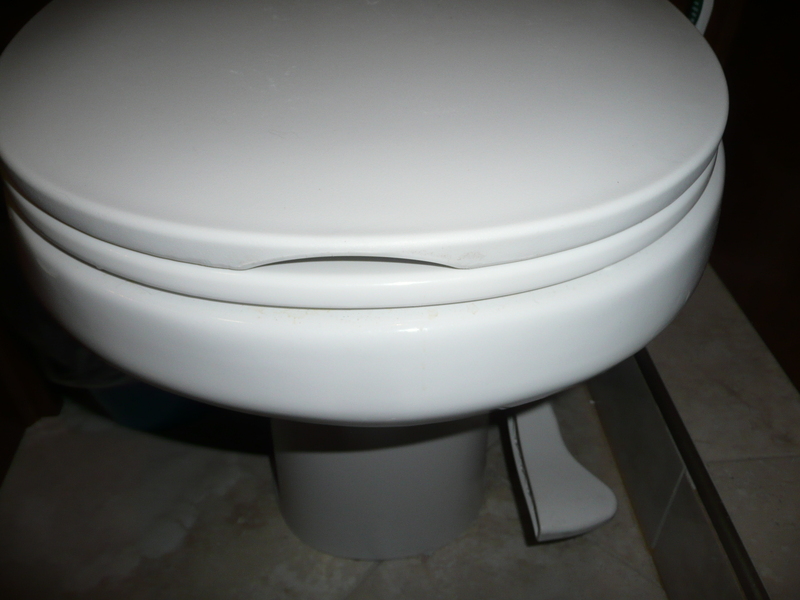 Our little tiny toilet is made from porcelain (just like a house), and in a separate room from the shower area (love that) but you don’t even have to touch this one with your hands… notice the foot pedal that flushes everything into the sewer (just like in a house..). When I say we are fully hooked up in a park space like we are now, this is what it looks like for those of you that may not know…. The large black hose with the orange ring on the end is our sewer line that empties directly into the sewer here at the park. Works just like a sewer line in any home. 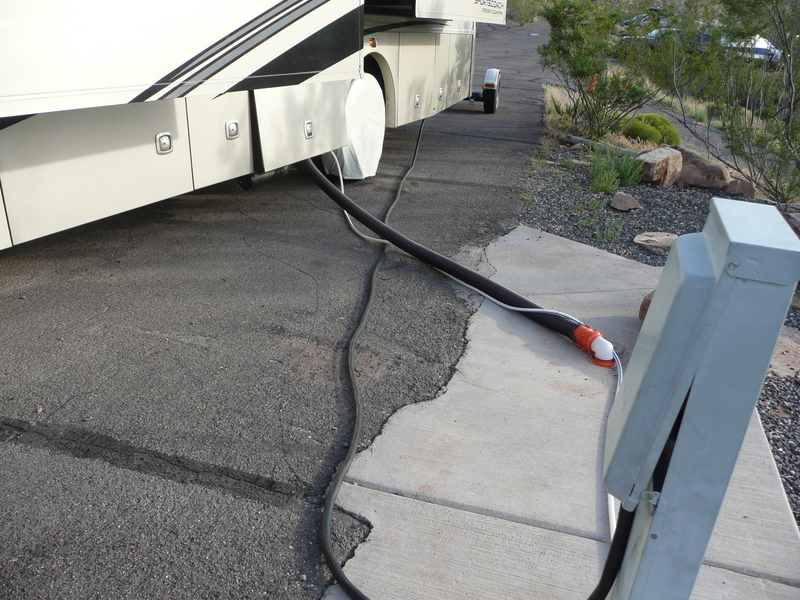 The smaller black cable is our electric line that hooks directly into the electric here at the park. 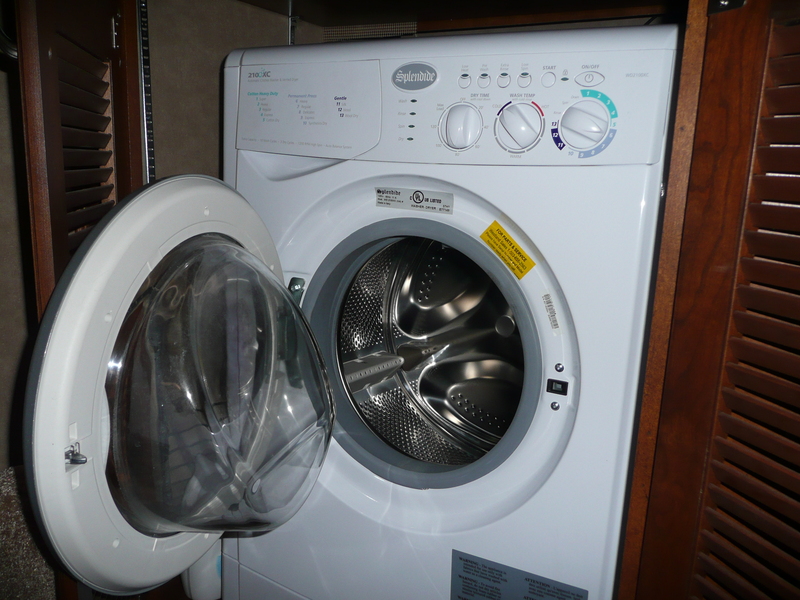 Runs our two refrigeration units that cool our motorhome and all our lights etc. just like in any home. The white line is our water line that hooks directly to the water line here in the park… And, the best thing about all this is when we are work/camping like we are now, all our water, electric, and sewer is FREE!!! If/when we ever go what is called “dry camping” we would be running off our own self-contained energy, i.e. our solar/and or our generator, and using water that would be stored in our water tanks and we would then have to go to what is called a “dump station” where you go and dump your “black” or sewer water and your “gray” or shower type water… Most parks and campgrounds have dump stations, if not you just have to look one up in your area. 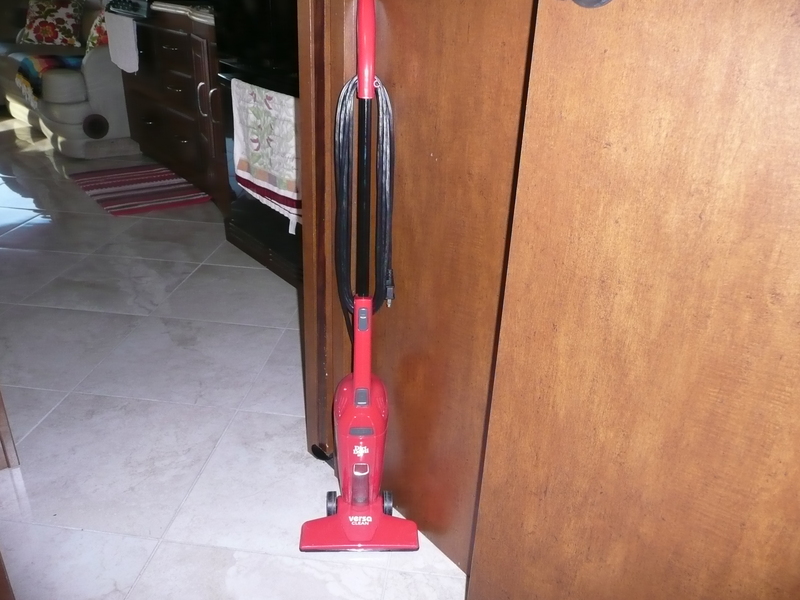 When living in small spaces, you tend to gravitate to small things, like this tiny little vacuum cleaner I use everyday to vacuum up any cat hair from our cat Carmen, and to get up any cat litter she sometimes scatters out of her litter box when she goes about her “business”.. I also have a tiny little ironing board that actually hangs in the closed. How sweet is that..? And, doesn’t Bill/Bro just look delighted to hold that up for me so I could snap a picture for you all… I interrupted something he was doing on the computer…. I so get that, and I hate it when that happens… Ha! 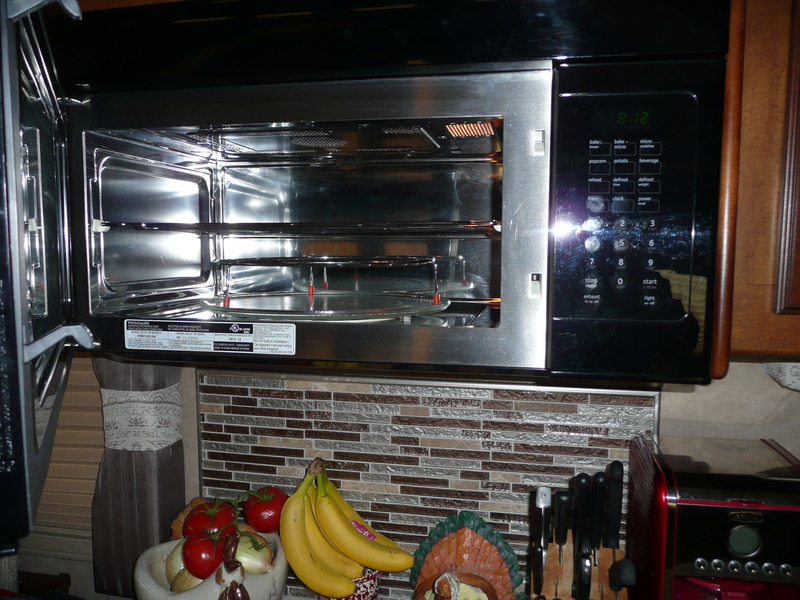 When living in small spaces you come to love things that do double duty… Our microwave is also a convection oven that works just like any regular oven to brown things. Ours will even do both microwave/brown together. SWEET! When we are not working or exploring all the beauty Utah has to offer, Bill/Bro and I love to cook. Our kids, Patrick and his wife Celina, Katie and her husband Josh, and our son Marty gave us a Traeger Smoker/Grill and we have had so much fun playing around with different recipes to cook in that. Just last night I mixed up and turkey meatloaf and Bill/Bro smoked/cooked it out on the Traeger Grill. 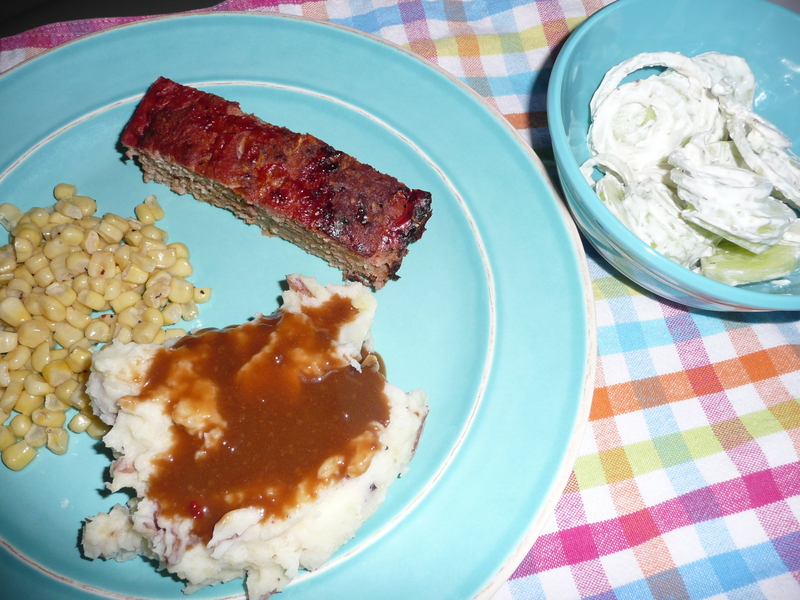 We served it up with mashed potatoes, gravy, corn and cucumber/onion salad… YUMMERS… Life is soooooooooooo GOOD!!! Tonight Bill/Bro is going to smoke a pizza out on the smoker/grill. Can’t wait for that!! 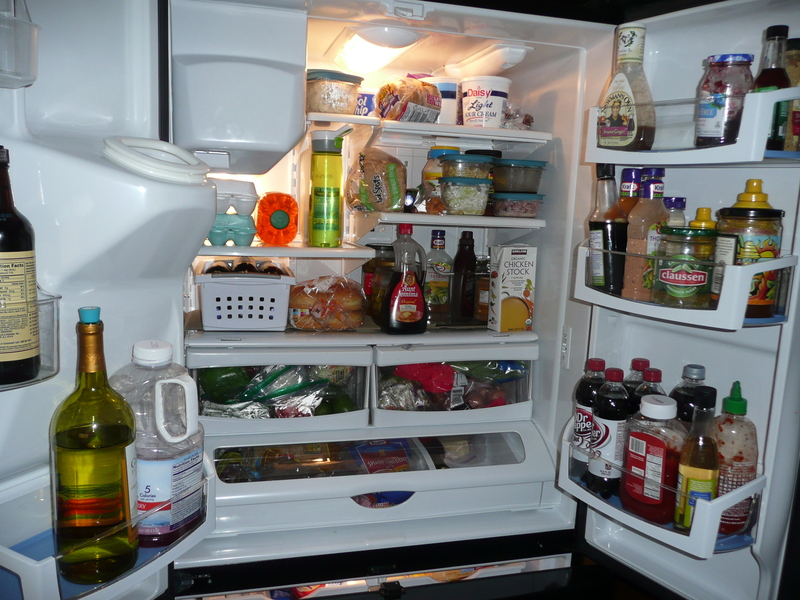 We have a full-size residential French-door refrigerator with a freezer on the bottom that is always fully stocked and ready at a moments notice to allow me to whip up appetizers or a dinner for anyone that might stop by… because I’m going to be the best camp host EVER… Ha! 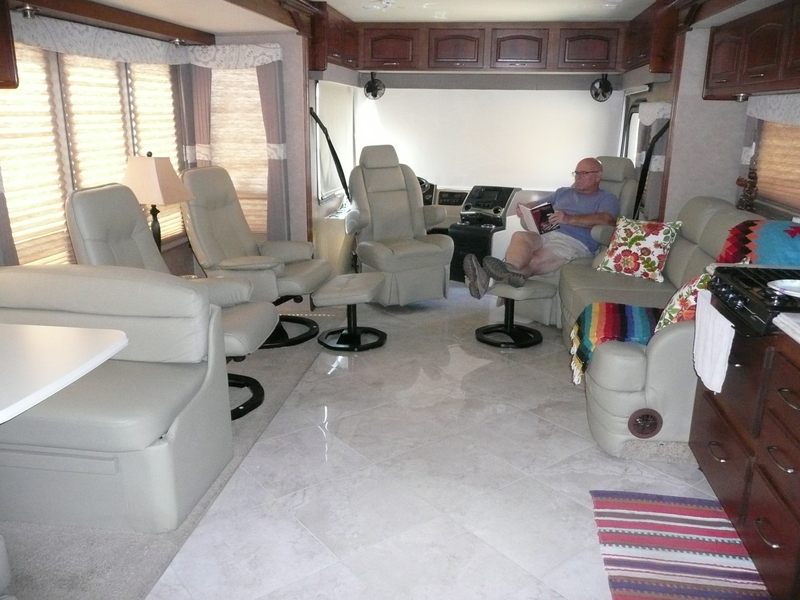 The outside of our motorhome has six large bay areas, we call them our basement…. that houses any and everything we need. 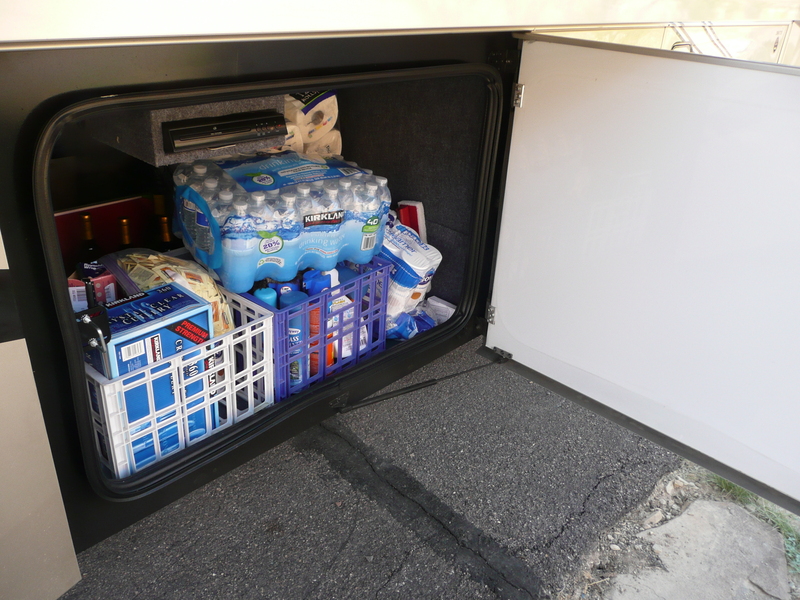 Extra supplies, got to have a place for my wine…., and our outside patio chairs, B-B-Q grill etc. Any questions? I’m happy to answer any and all questions about our new life any time! 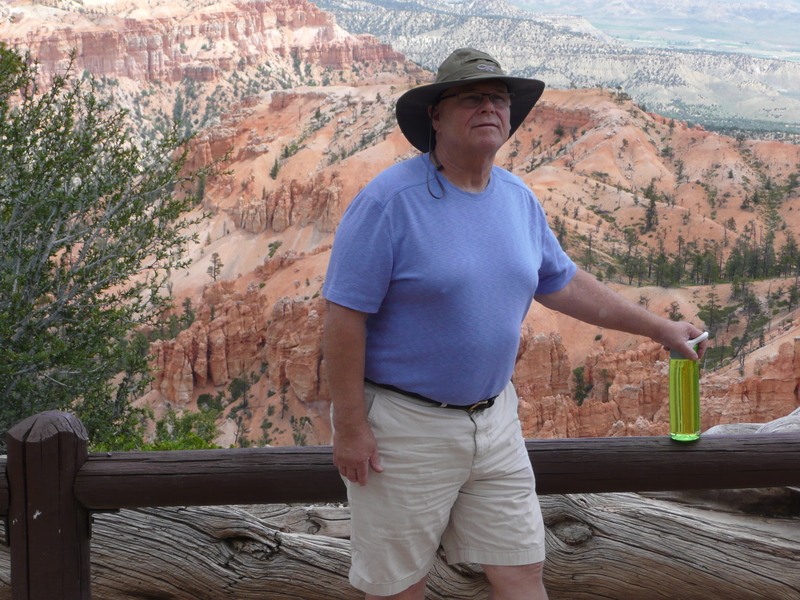 My husband, Bill, and I are enjoying our camp host position at Quail Creek State Park in Utah. There is so much to see and do, and we are learning so much about what it takes to operate a State Park, and how important it is to keep the lakes and waterways clean and free of contamination. I never caught him up in the air…. 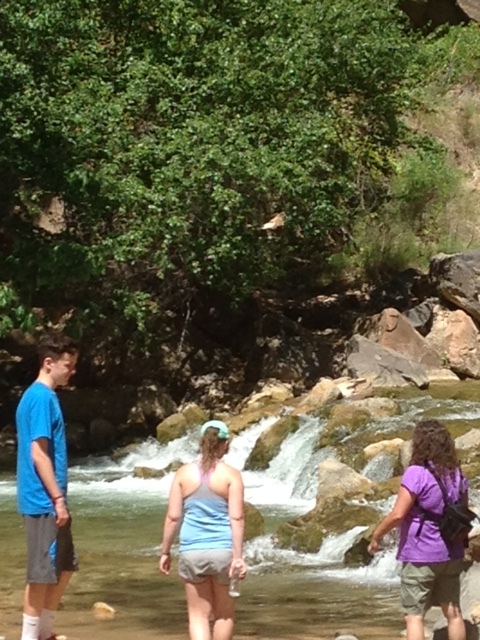 But I sure enough caught him when he did something wrong and did a big belly flop into the water…. and even inflatable toys… all of which have to be inspected at the gate before they can launch them into the water of Quail Creek Lake. Why you might ask? and these…. 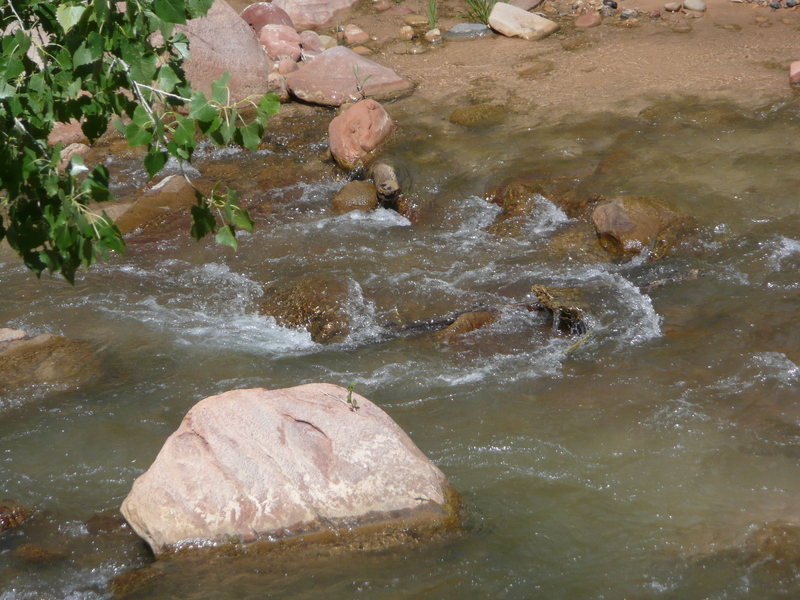 These are Zebra mussels (photo courtesy of Arizona Game and Fish Dept.). Both are VERY destructive when they get into the lakes and waterways. 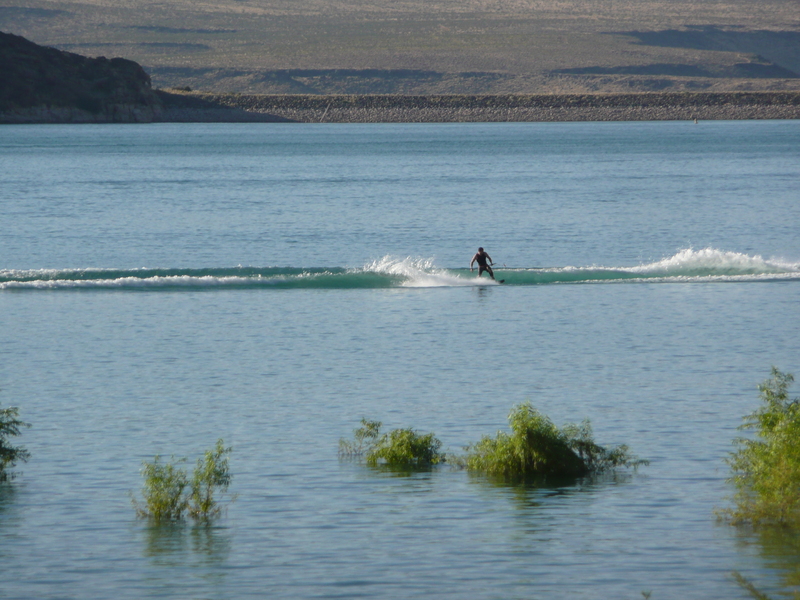 Lake Powell, Deer Lake, and several other Utah lakes already have quagga and zebra mussels in the water. Actually they are overwhelmed with them. 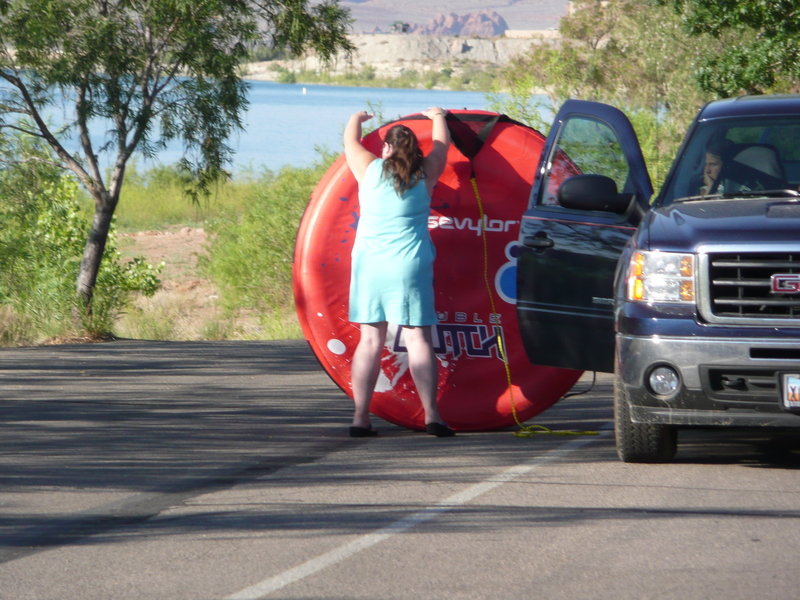 So if a boater had his/her boat on Lake Powell, Deer Lake etc. then came to Quail Creek Lake, they can bring the quagga and zebra mussels with them in their boats/watercraft and contaminate Quail Creek Lake as well. 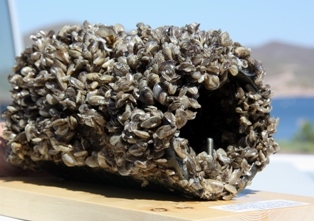 Both quagga and zebra mussels attach themselves to hard surfaces like boats and water pipes. The first picture above of the quagga mussels is an example of how they can attach themselves to a water pipe and eventually clog the pipe completely. That pipe was a test and was in the water for only eight months. Both quagga and zebra mussels multiply extremely fast and even the tiny baby mussels before they produce their shells can attach to hard surfaces where they can grow and multiply. 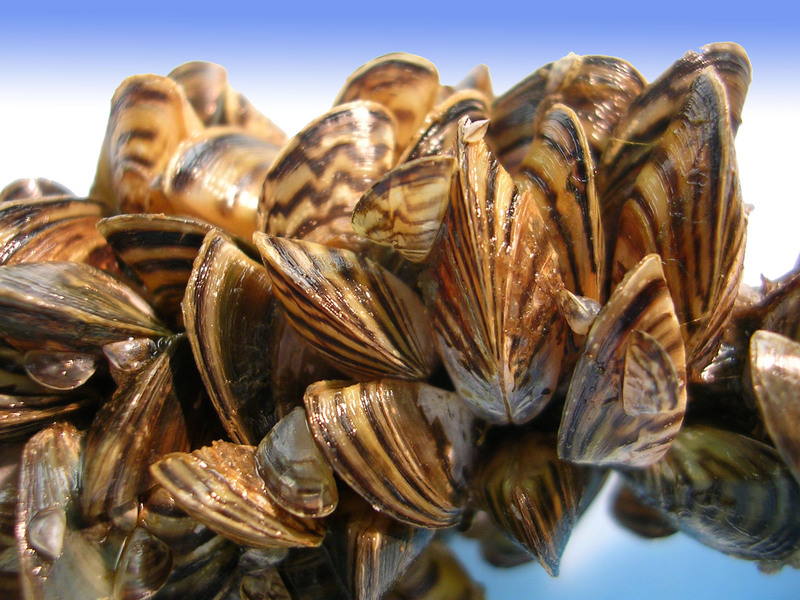 So in order to keep these mussels from entering Quail Creek Lake and Sand Hollow reservoir, ALL water craft must be inspected for any standing water and/or any evidence of quagga or zebra mussels. In order to do that “we” the camp ground staff working the area, must stop everyone entering the lake area with water craft and physically inspect each and every one. If we find any standing water, or any evidence of quagga or zebra mussels, we have to send them to Sand Hollow (about five miles down the road) to be decontaminated. That process involves cleaning the entire water craft with very hot water that will kill the mussels. Then they are given a slip that allows them to bring the water craft back to Quail Creek Lake and allowed to launch their craft into the water. Some people are not happy when they are told we found evidence of quagga or zebra mussels or standing water where baby mussels too small to be seen could live… But we remind them that it is a federal offence to transport any water from one lake to another and/or to launch any watercraft known to have evidence of quagga or zebra mussels… When told that they either go get decontaminated or we will call the law enforcement…. and they could be fined and/or spend time in jail… they opt to go get decontaminated. 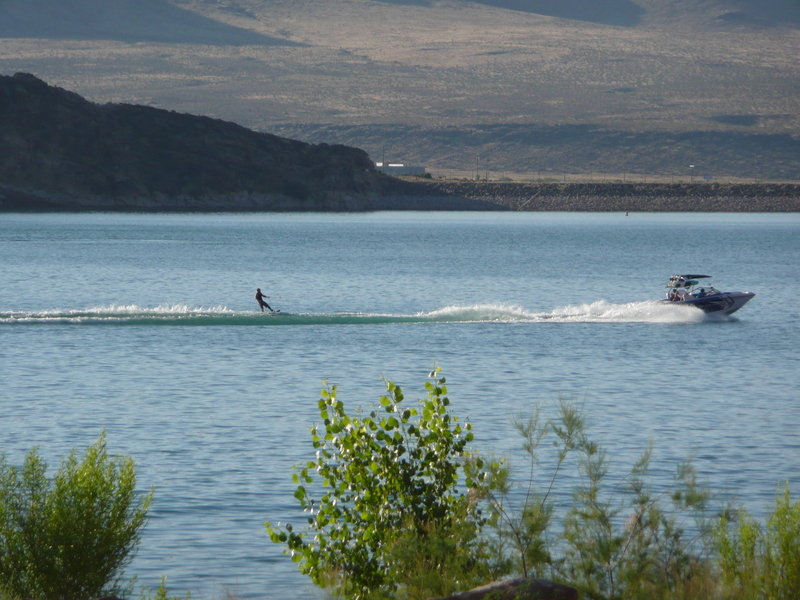 All boaters and people that own watercraft in Utah know the rules of the water. 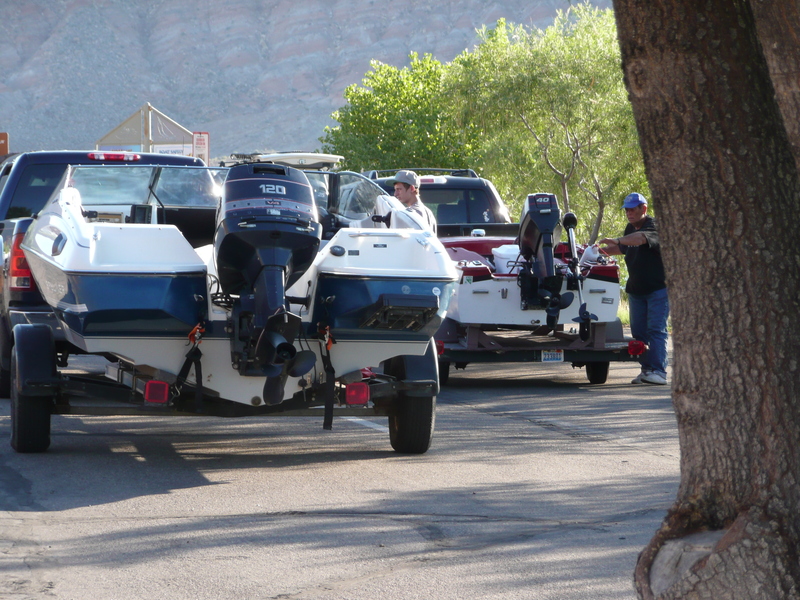 They must clean, drain, and completely dry out their watercraft after every use. Letting the watercraft completely dry out is the only way to kill quagga and zebra mussels without using the decontamination process. Most boaters want to keep their boats clean, drained, and dry because the mussels can damage their expensive boats/watercraft just as much as they damage the lakes and waterways. But, there is always that one or two that don’t care and make things difficult for everyone else…. 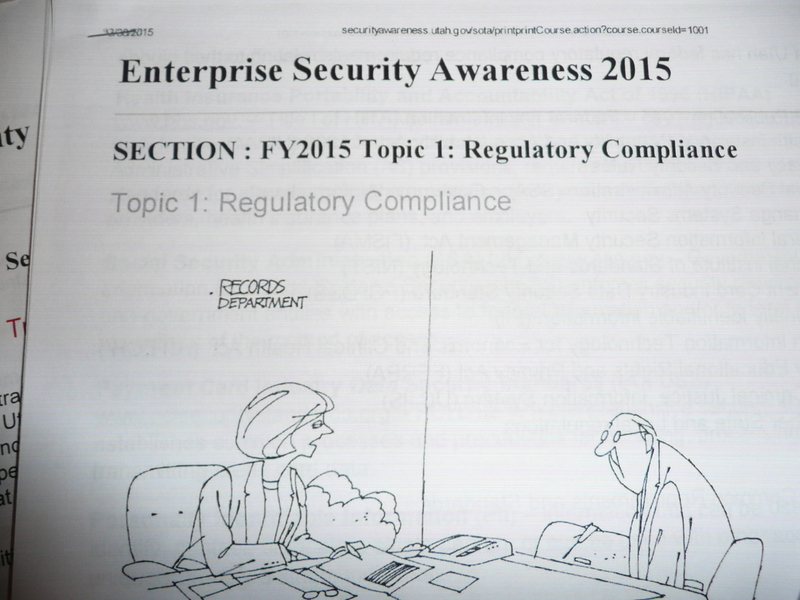 Until they get to our inspection sites and find out they just made life more difficult for themselves…! 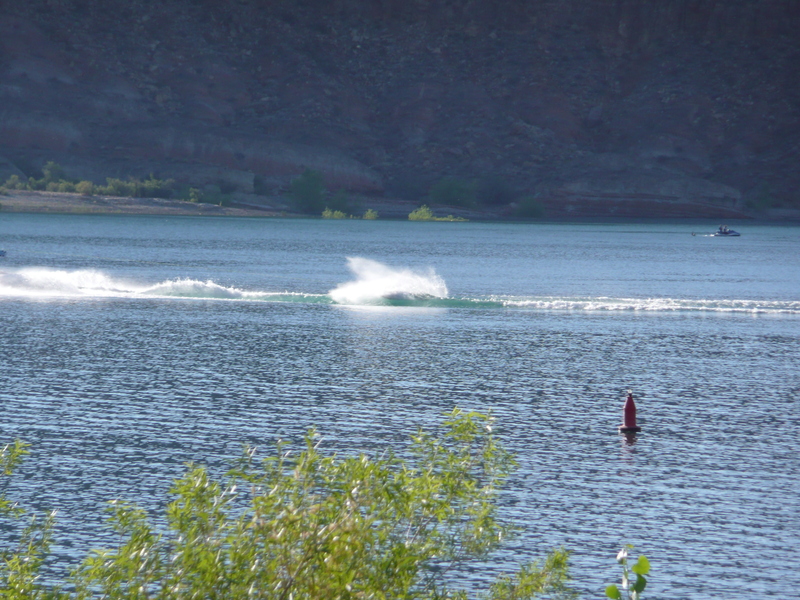 For the most part everyone that comes to Quail Creek Lake have fun and enjoy their time on and around the water. However, it saddens me to say that not everyone follows the rules and sometimes that ends in tragedy. Last week a 30-year-old man tried to swim from the boat launch area to the fishing dock, both areas are clearly posted NO SWIMMING AREAS. He began to have difficulty 20 feet from the fishing dock and drowned right in front of his mother, who was standing on the fishing dock watching in horror but unable to help him because she couldn’t swim herself. Unfortunately, no other people were close enough to get to him before he sank to the bottom. Divers recovered the body later that night 15 feet down under the water and 20 feet from the dock. So, so, sad, and so avoidable if people would just follow the rules created for their own safety. 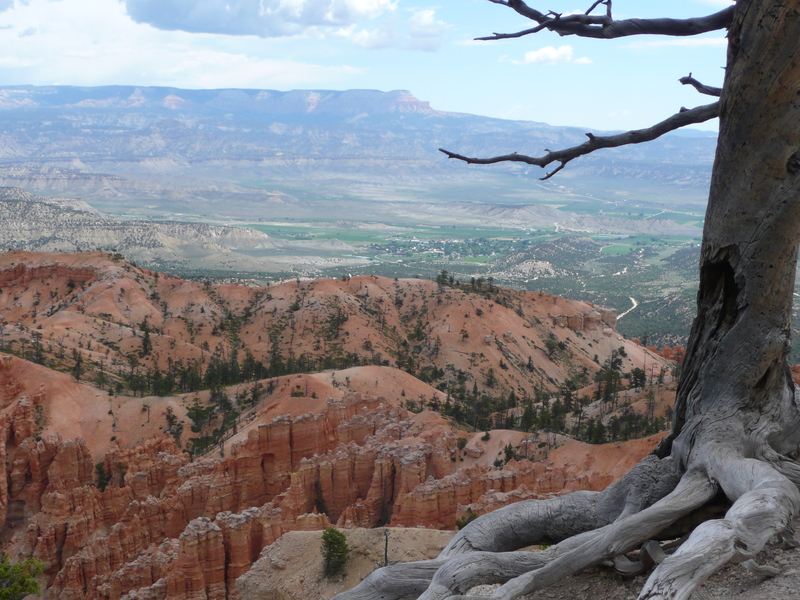 Words cannot describe the beauty of Bryce Canyon. Especially if you have never seen it before. 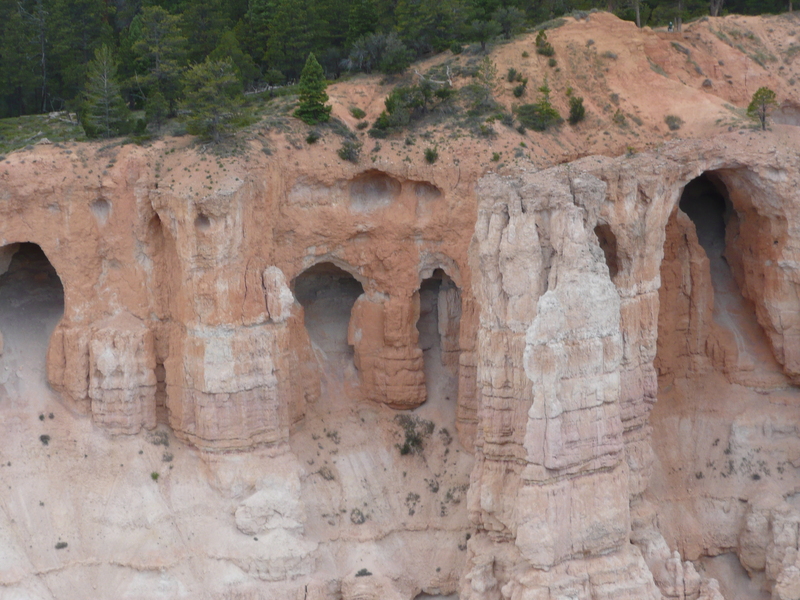 Before Bill and I took our day trip to see Bryce Canyon, I had only seen pictures of it. 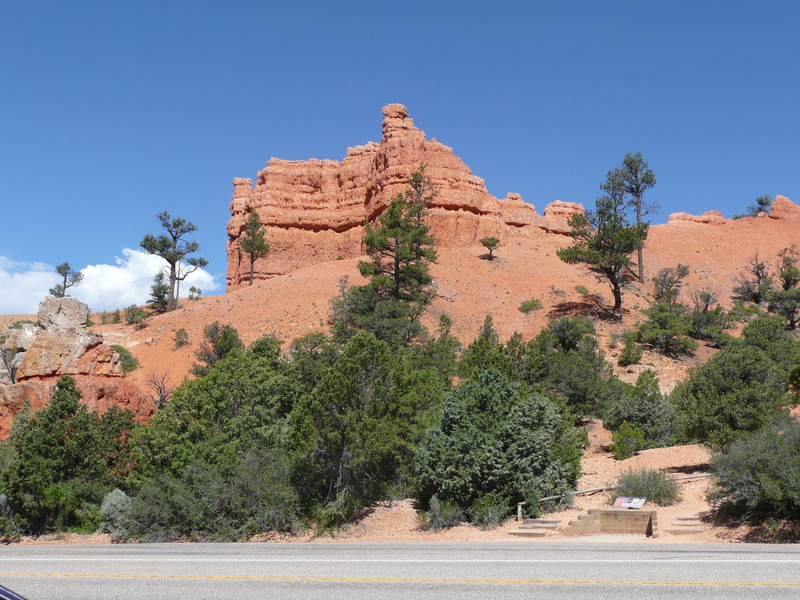 However, when we rode the shuttle bus to Bryce Point, the highest point of the canyon, and the shuttle made the turn into the parking area, the absolute beauty of it took my breath away and I was speechless, which for those that know me know that doesn’t happen often….What words would you use to describe this when seeing it for the first time? 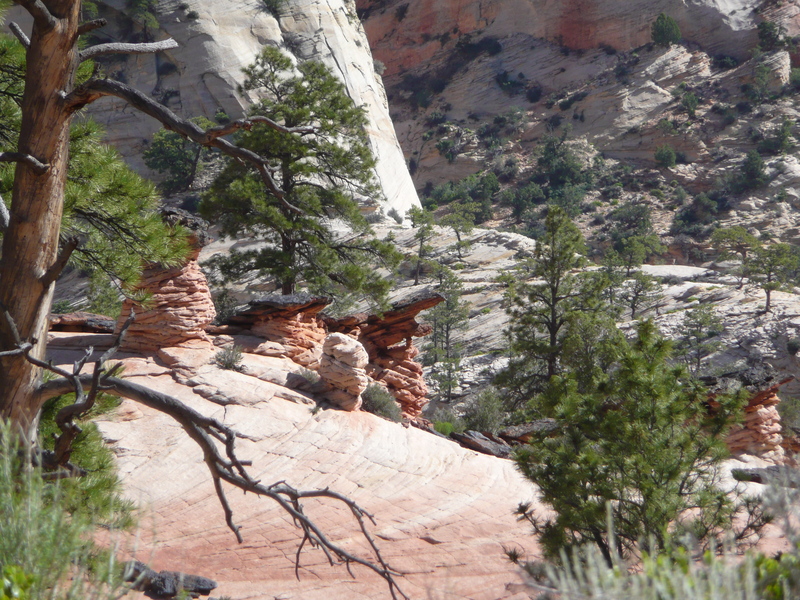 The picture above shows what are called Hoodoo formations. 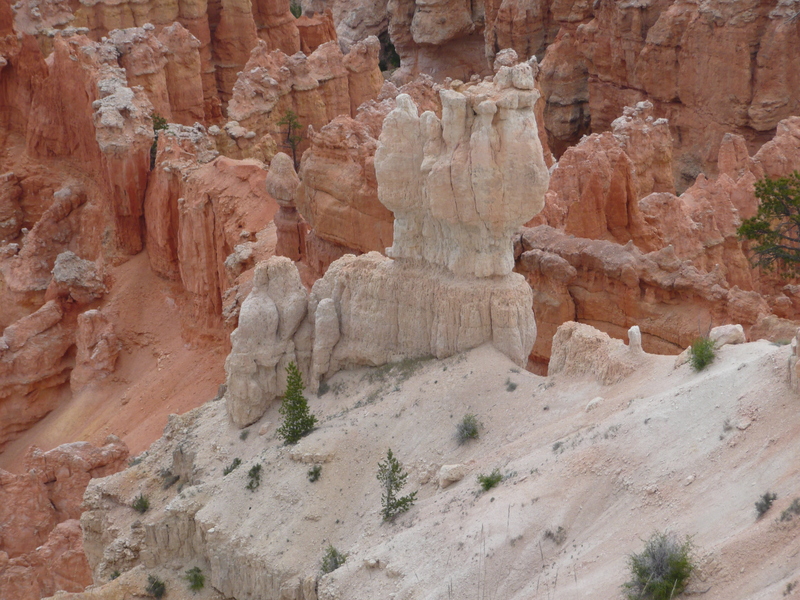 Hoodoos don’t grow like trees but are eroded out of the cliffs where rows of narrow walls form. 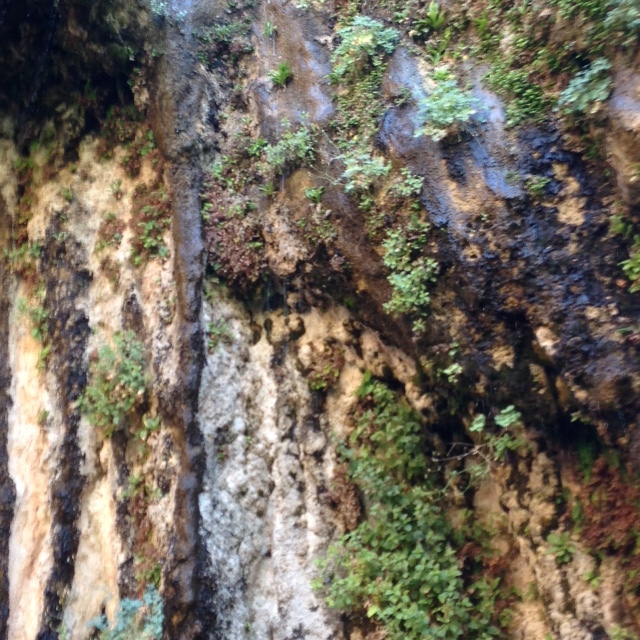 These thin walls of rock are called fins. 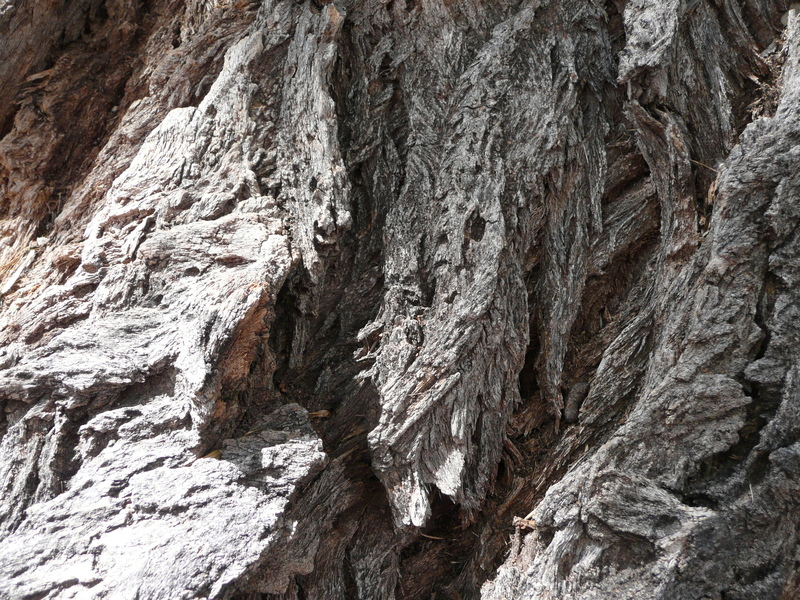 Frost-wedging enlarges cracks in the fins, creating holes or windows. As windows grow, their tops eventually collapse, leaving a column. 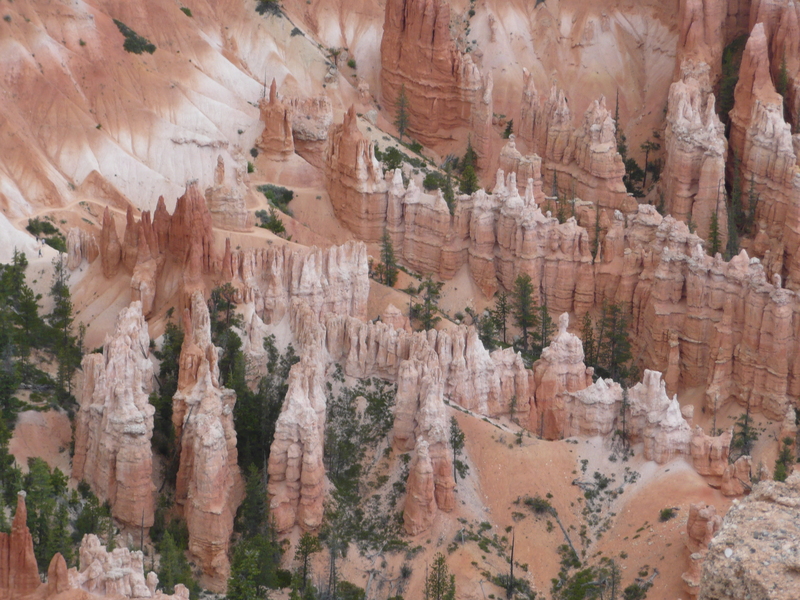 Rain further dissolves and sculpts these limestone pillars into bulbous spires called hoodoos. The delicate climatic balance between snow and rain ensures that new hoodoos will emerge while others become reduced to lumps of clay. Each stop along the shuttle run offered another opportunity to enjoy what is now our new backyard, at least for the next few months! 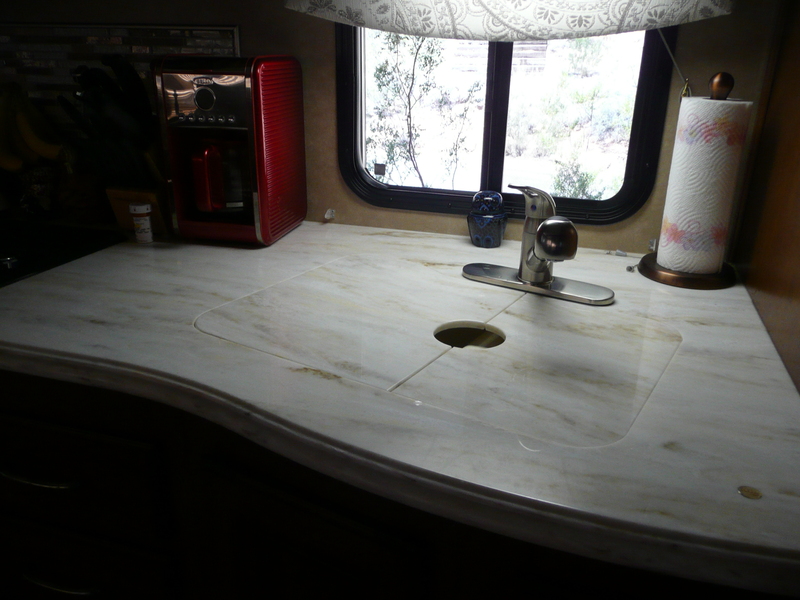 In my last post I tried to sum up what prompted us to want to give up all our possessions, including our home, and become full-time RVers… I hope these pictures can help add to my words of why “Less Is Now Really More” at least it is for Bill and I, and we are having the time of our lives! At least it is for my husband Bill, and I. 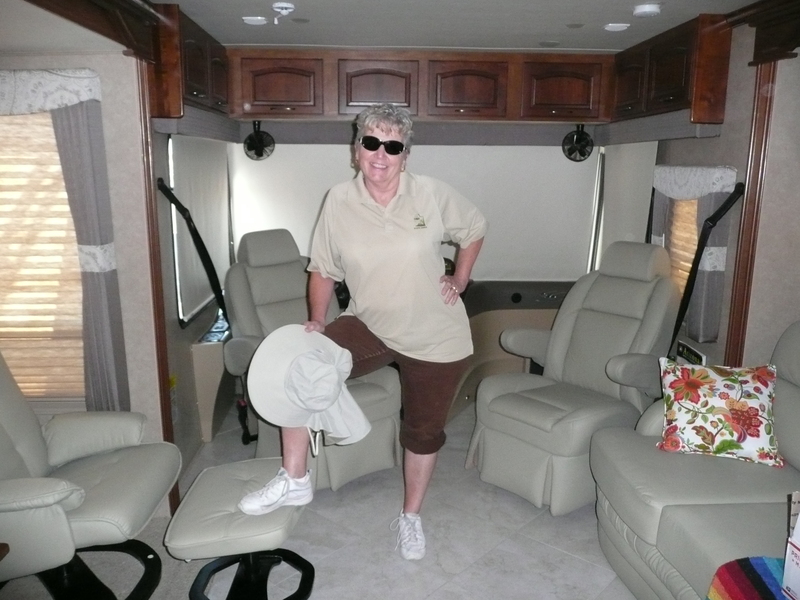 If you follow my blog you know that Bill and I just recently retired, sold everything we owned including our home, bought a 39 foot 2013 motorhome with only 11 thousand miles on it, and are now full-time RVers and we are loving every minute of our new lifestyle. Since we made the decision to become full-time RVers, we have been asked over and over again what prompted us to go full-time RV instead of keeping our home and buying a travel trailer and just travel at will… I will try to answer that question now. Bill and I met at work 28 years ago. We became friends, and over time, that friendship bloomed into a love affair unlike anything I had ever known, and it wasn’t long until we knew we wanted to spend the rest of our lives together. We married on September 6th 1988 and very quickly found that when we were not working, we loved spending our days off taking trips around Arizona. 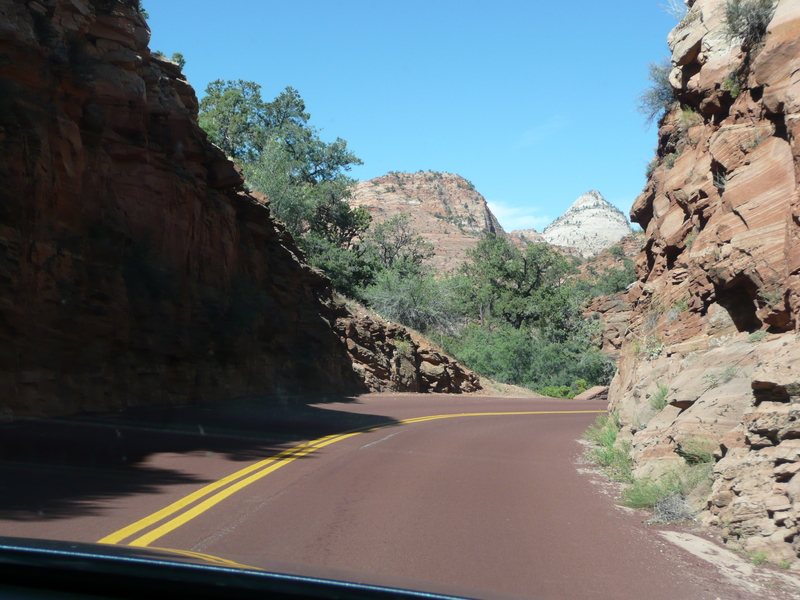 We spent a lot of time exploring Sedona, Prescott, Payson and Jerome. When we had a long weekend, we would take advantage of South West Airlines deals to San Diego. We could hop on a plane and be there in 45 minutes. We began to think of San Diego, and especially Coronado Island, as our personal playground.We were so in love and happy and one way we expressed our happiness was slow dancing around our room. Fast forward five years and we adopted our daughter, Shantel, and our lives revolved around her and her needs. When Shantel lost her sight to cancer at the age of two, our lives changed again as we educated ourselves on how we would raise her and give her the best foundation on which she could eventually grow up and create a life of her own, independent of us…. Of course, if you follow my blog, you know the long complicated story of what we faced during the years Shantel was in school and the toll that took on all of us. So much so that when Bill came home from work exhausted from the physical labor of his day, and I came home exhausted from the mental stress of my workday and dealing with the school systems to help Shantel have what she needed to be successful throughout her school years…we no longer had the energy to dance…, and that always made me sad… We never lost our love for each other, and our underlying friendship was always there…., but it was just so hard to make the time we wanted when we were always so exhausted… But through it all, we always agreed that we were doing the right thing and we would do it all over again if needed. As the years passed, eventually Shantel graduated college with two degrees and made the decision to move out and into her own apartment. Bill and I were so very proud of her but fearful for her safety as well. To be honest, I never really thought Shantel would want to stay in her own apartment, living alone, long-term… But after the first year, she signed another year lease and I came to terms with the fact that this is really what she wants and I started turning my thoughts to what now? What do Bill and I do with the rest of our lives… ? Bill and I found ourselves alone again in our home after 20 years of raising a second family… and we began to reconnect on a much deeper level again. We started doing the type of things we love to do again, and I started thinking about the possibility of retiring and traveling around the United States and Canada, something I’ve always wanted to do but kept that as my personal secret because I also had responsibility for seeing after my mother who lives in a Care Center. I remember thinking that there just never seemed to be the right opportunity for Bill and I when we had no one to be responsible for but ourselves. But, I soon found out that I was wrong. Over the Christmas holidays, I began thinking of reconnecting with my daughter, Katie. I reached out to her and she responded, and we reconnected and began working on rebuilding our relationship… Then, slowly, Shantel reconnected with Katie and I knew then that if Bill and I were to retire and travel, Shantel would have someone, other than our dear friends Holly and Chuck, and her best friend, Jaz, to depend on if she ever needed help. My mother’s health was in real decline and as I watched that progress over time, I knew there was nothing more that I could do to help my mother, and I knew that she was in good hands at the Care Center. Over the past six years, I visited my mother 2-3 times a week and I really got to know the staff. They are all very kind and work hard to support the needs of all the residents. So, with the knowledge that Shantel would be fine without us there, and my mother in good hands, I started talking to Bill about selling everything and buying a motorhome and traveling. At first Bill didn’t think I was serious… he didn’t think I would really sell all of our possessions and live in a motorhome. We had a beautiful home and lovely things, but I knew we could not afford to keep the house up and do the kind of traveling I wanted to do… I want to be able to go where ever we want and stay as long as we want… and with our home being paid off, I knew we could take the money from the sale of the house and pay cash for our motorhome. I also did my research and knew that there are lots of opportunities throughout the country to “work camp” where you work a few hours a week in exchange for your park fees and you get full electric, water, sewer etc. for your motorhome. So basically when you work camp, you live free except for your food and gas in the car we drive to get around town… And with our pensions, and social security, we would have more than enough to really enjoy our traveling years. 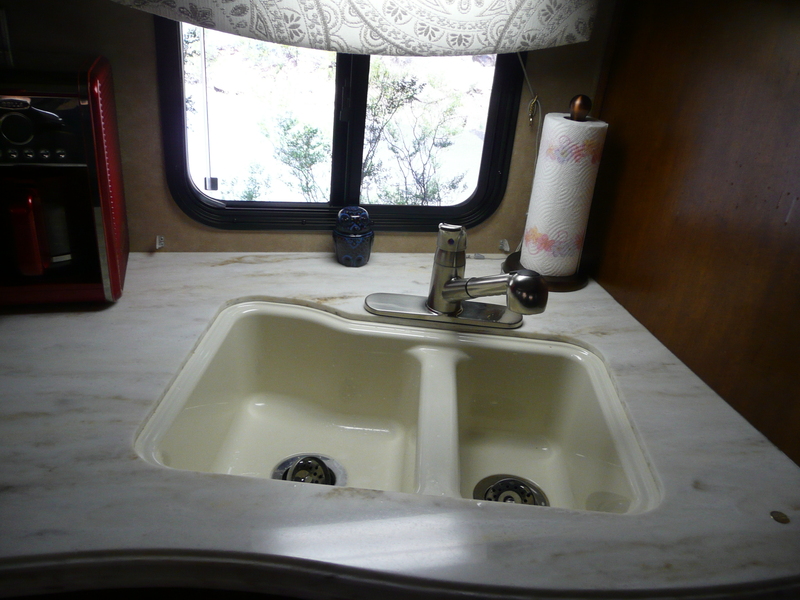 Once I had all my research completed and knew the facts about full-time RV life, I knew that was what I wanted to do. I just had to decide if I wanted it bad enough to give up everything we owned and the life we lived to obtain it… When Bill and I sat down and really discussed the details of the full-time RV plan he said he loves to travel and knew he could live anywhere with me as long as I was happy… I told him I never wanted anything so bad in my life and I was willing to do whatever it took to accomplish this dream. The next week we had a huge estate sale and sold everything…. and the following week we put the house on the market and it sold for full asking price in 24 hours. 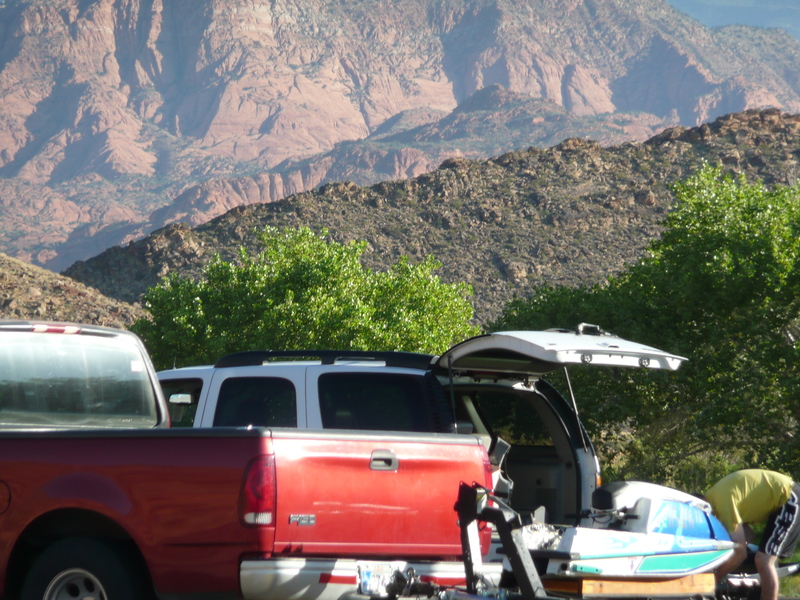 Three weeks later we bought our motorhome and we are now parked in Quail Creek State Park in Utah where we secured a camp host position until October when we will go back to Phoenix for the winter. 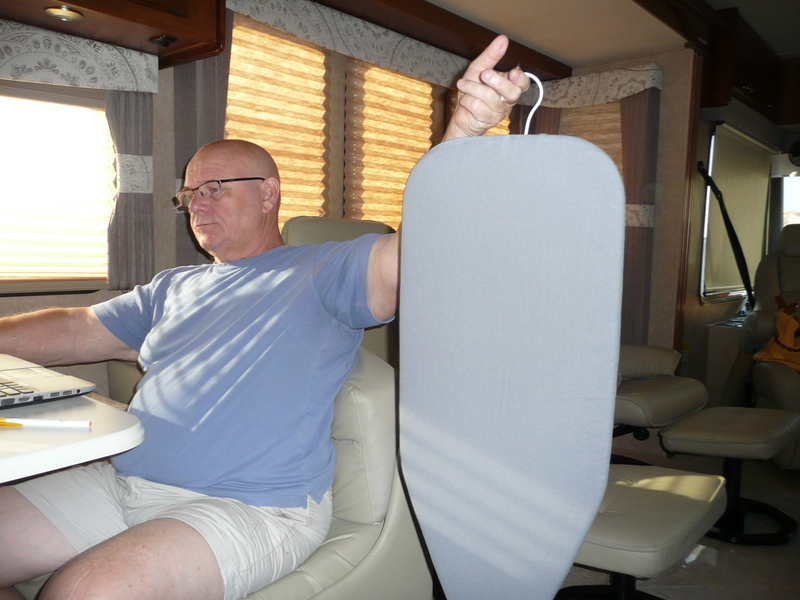 Bill and I are living our retirement dream and loving every minute of our new full-time RV lifestyle… And, for the first time, in a long time, …. we dance! 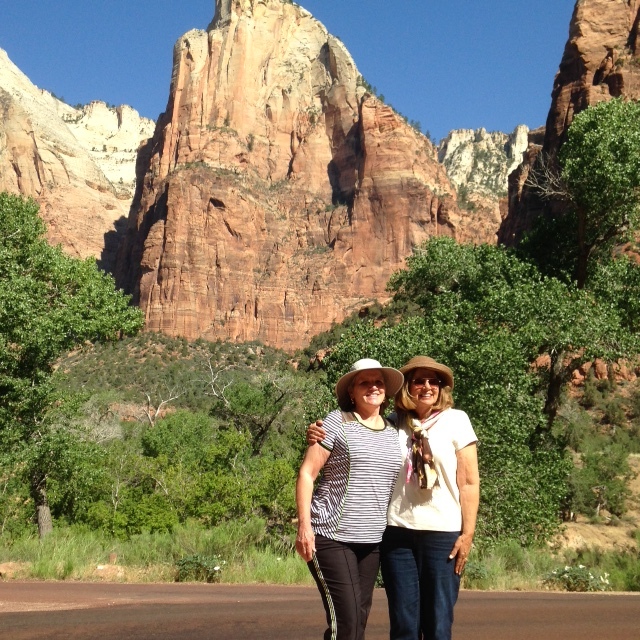 Today my husband, Bill, and I continued our camp host training by visiting Zion National Park Utah. I know I said in my previous post about Snow Canyon that my words and/or pictures just don’t even begin to give the beauty of Utah justice but I will share with you what I captured today and hope that you can imagine it a hundred times more majestic than I can show you here..
People have occupied the landscape of what is now Zion National Park for thousands of years. 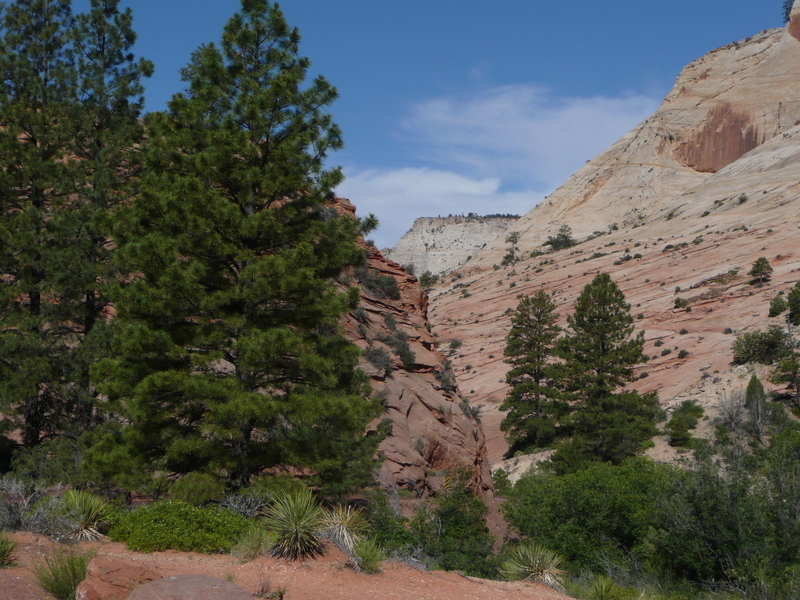 Zion’s first residents tracked mammoths, camels, and other mammals through open desert and sheltered canyons. With climate change, disease, and overhunting, these animals died out 8,000 years ago. Hunters adapted by hunting smaller animals and gathering food. As resources kept diminishing, people adjusted to suit their location. One desert culture, evident here still, evolved over the next 1,500 years as a community of farmers now known as Ancestral Puebloans. But drought, resource depletion, and migrations eventually decreased the Ancestral Puebloans dominance. The Southern Paiute people who followed brought traditions suited to the harsh desert climate and thrived here. 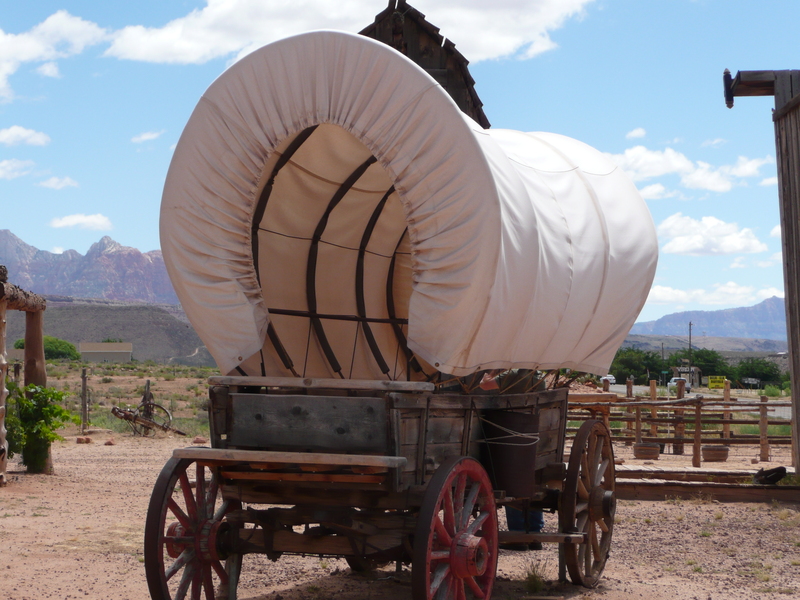 Westward expansion eventually brought new settlers to the canyon. 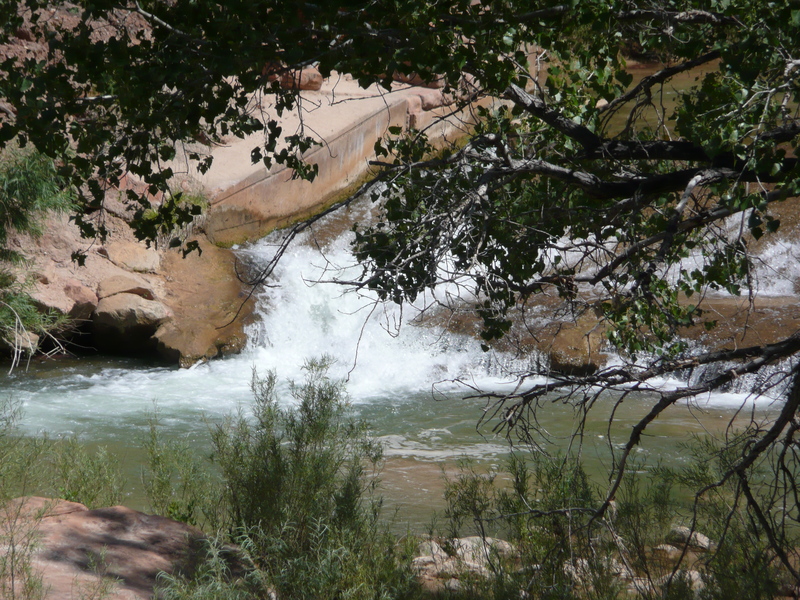 In the 1860s, early Mormon pioneers came to the region and built small communities and farmed the river terraces. 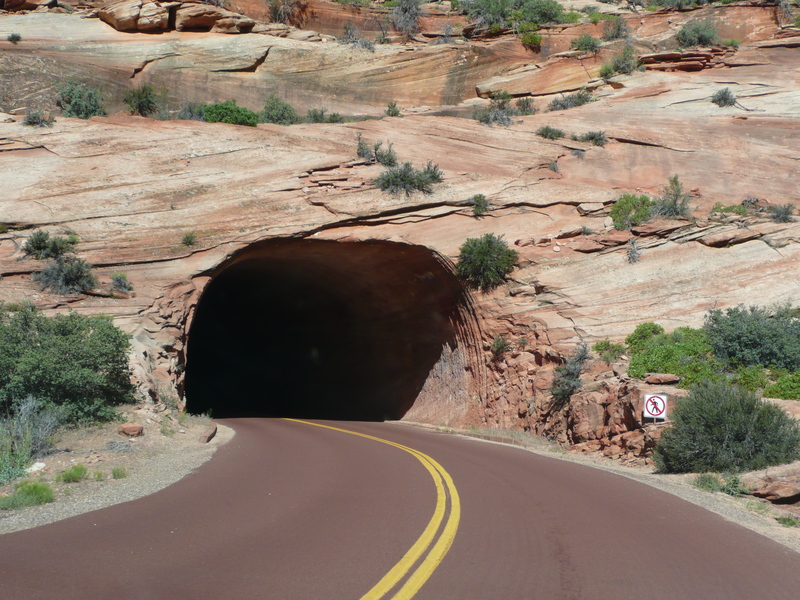 Halfway through the switchbacks, we drove through two long dark tunnels that take you right through part of the mountain cliffs. We even had a visitor stop by to say hello. But I said “No, No, No”…, you’re not getting any of my fresh, sweet, strawberries! 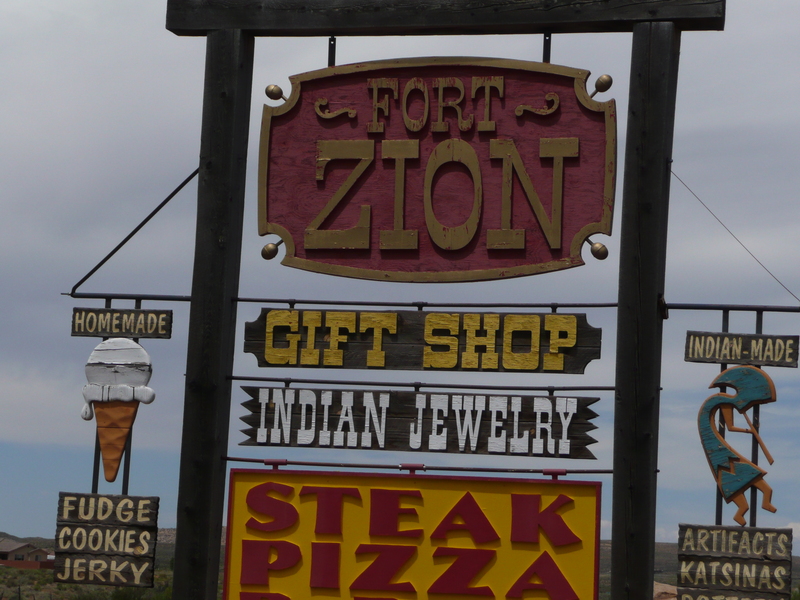 After lunch we made our way back to our camp site, but not before stopping at Fort Zion that is a gift shop and offers unique Indian Jewelry, as well as a small petting farm complete with a little western town to visit. 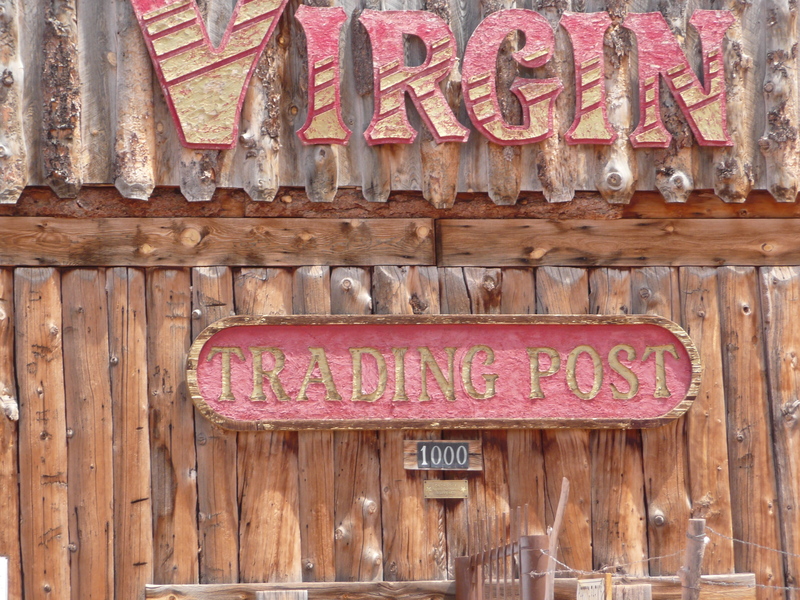 How could we resist taking a look around the Virgin Trading Post? Even though I’m not…. they let me in any way. Ha! 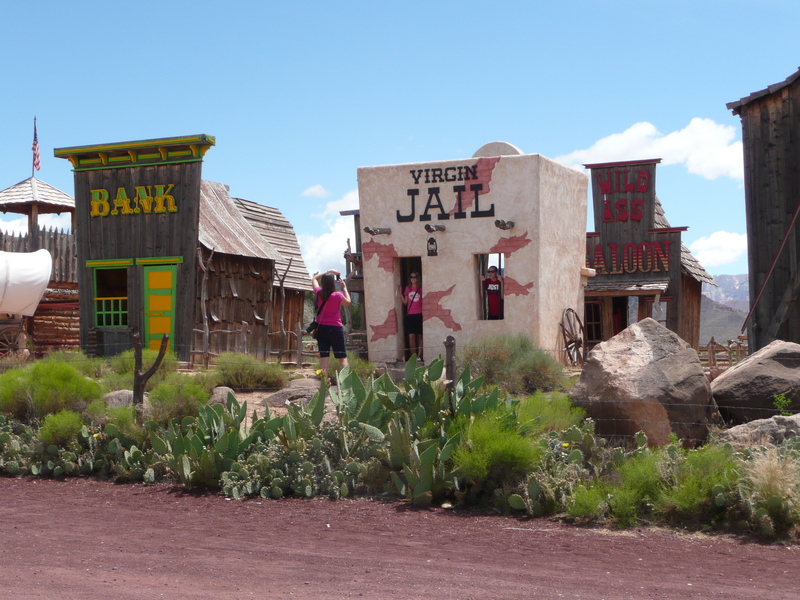 How adorable is this little western town complete with a jail, bank, and of course a saloon! 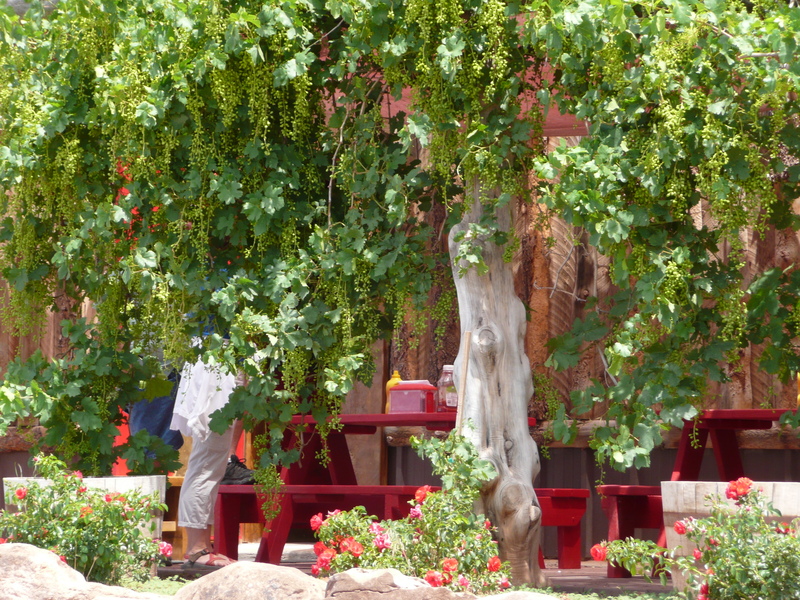 Upon leaving the Virgin Trading Post and surrounding western town, I noticed that the whole front of the trading post was covered with beautiful grape vines… A big detail I missed… How pretty is that?